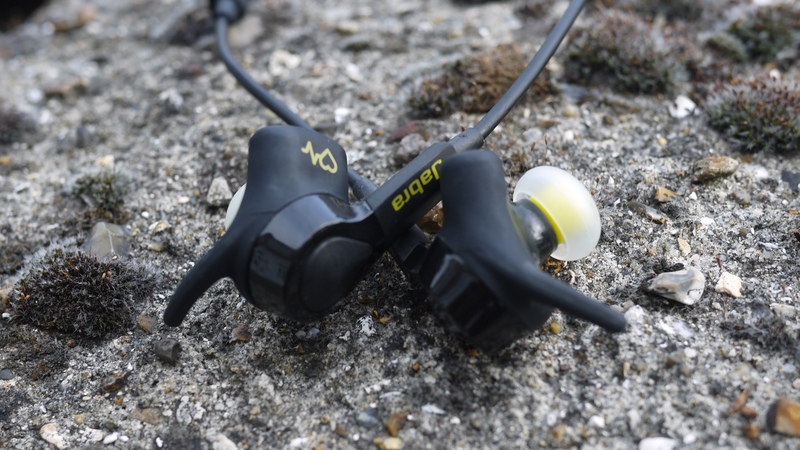 The era of the hearable is truly upon us – so much so that the Jabra Sport Pulse Special Edition is an update to its category-defining biometric headphones released back in 2014. Based on the suitability of the human ear for biometric sensors, the Jabra Sport Pulse headphones replace many of the features of the latest GPS running watches. Jabra CEO: "We are a hearable pioneer"
Heart rate, pace, distance and after-run reporting are all catered for straight from the ear – but do they work? And are they the right device for you? Read on to find out. Looking at the Jabra Sport Pulse Special Edition you'd be hard pressed to differentiate them from a normal pair of Bluetooth buds. The enhanced nubbin on the left earphone is the only clue, and that's the bit that reads your pulse from the thin skin inside your ear. They're lightweight, really comfy to wear and we have to say they're some of the most secure headphones we've tried. Even when things get really sweaty, the Jabra Sport Pulse earphones stay in place, and resist gravity's usual insistence on gradually pulling them from your ear canals. So what do they do? Well, firstly music, which is kind of important. Just hold down the button and pair them up to your smartphone – simple. But they're also good for calls too, with a microphone placed on the remote unit on the wire. No complaints here in terms of call quality. That's the boring stuff out of the way. The real reason you're picking up the Jabra Sport Pulse Special Edition is for the sports tracking. We'll dive deeper into that shortly, but there are modes for an insane array of sports. In the cardio section you can access running and cycling (indoor and outdoor) as well as skiing and skating, but that's ignoring the host of guided workouts from BellyBurn and MadCore to LegDay and UpperBodyPump, for all-over workouts. There's even a section of fitness tests including VO2 Max, Cooper Test and a resting heart rate exam too. The workouts make use of the button, which is located on the left bud. You can start and stop workouts from here and move on through your sets by pressing the button when you've completed each one. It makes for one of the most exciting line-ups of wearable sports coaching since Moov Now – and a totally different proposition from the likes of Fitbit, TomTom and Garmin. It's a gym membership and a personal trainer in one set of headphones – but does it have the power to upgrade your fitness? Sports are tracked with the Jabra Sport app, which is available for Android and iOS devices. And this is the big downside to the Sport Pulse headphones: You need the app and your smartphone to go and work out. For some people that's commonplace, but if you're rocking a Nexus 6 or iPhone 7S, that's not always convenient. This is very much a choice thing. While that's a bit of a disappointment, the metrics captured by the Jabras are pretty impressive. By partnering up with your phone they can use your handset's GPS to get pace and distance information, as well as gleaning data from their own built-in sensors. And as well as an optical heart-rate monitor for capturing continuous data from your workout and plotting average, peak heart rate and intensity zones, they also use an accelerometer to measure cadence while running and cycling. The complete list of metrics captured for running include distance, pace, time, heart rate, max heart rate, speed and cadence. Now, we had a couple issues with GPS during our tests, which arise from using a smartphone. On a long run the Jabra completely misreported our distance and pace – by a factor of 1.5 miles over an 11-mile run. However we tried multiple runs with the Jabra and only once had an incident of misreporting. It happens on a lot of phone apps from time to time – Strava and RunKeeper have both fallen foul in the past – and it actually ruined a training run. While running you get audio feedback on your progress at set times, usually every mile or 10 minutes. The Jabra Sport report is a bit of a barrage of data, with time, distance, heart rate, cadence and speed reported in that order. We've gotten used to training with a watch and being able to keep tabs on heart rate at a glance, so we did feel a little bereft of progress at some points. However, for long runs it's nice to kick back and just enjoy without stressing about heart rate zones. You'll also need to carry your phone during the guided workouts too. This means keeping it near the mat in the gym or in your living room to run through the workouts. It's no bother and the ear button works well, meaning you don't have to keep handling your phone during a heavy session. Another impressive aspect of the Jabra sports tracking is the number of modes. Aside from just running, you can set detailed target goals from staying within heart rate zones or target pace and even set up your own intervals. It's really easy, intuitive, and flexible – and the whole system is geared towards personalised training, enabling you to set personal heart rate zones within the app. One surprising omission is that that Jabra Sport Pulse still doesn't offer rep counting during its workouts. You press the ear button when you start and finish a set, and then the app moves to the next. It's actually easier and offers you more versatility in your workouts, but many users will be expecting automatic rep counting. One of the big talking points of the Jabra Sport Pulse is its heart rate accuracy – and we were highly impressed in our tests. Across the 11 mile run, its heart rate was locked onto a chest strap the whole way, and reported the same average of 159bpm at the end. Big kudos. We were curious to see how an interval session would hold up, as the lag times of optical sensors often make interval a no-go – but the Jabra Sport Pulse handled it with ease. We actually found that, watching the two figures side-by-side, the Jabra was faster to respond to your heart than a Garmin chest strap. As we climbed from 100bpm to 190bpm in our three minute sprints, the Jabra climbed much quicker, something we've not really seen before from an optical sensor. The only quirk is that we felt that the Jabra registered higher bpms than were actually experienced. During our interval session it reported a 196bpm max HR that was significantly higher than the chest strap, which is slightly suspect. While we do have our doubts, chest straps are far from scientific, and the results were too close to pick an overall winner. Another great feature of the Jabra Sport Pulse is their focus on VO2 max. While Fitbit and Garmin also use the metric, the Jabra puts it front and centre of your results, which we think is really neat. VO2 Max is a great measure of your fitness so it makes so much sense within the Jabra app. It marked our VO2 Max more harshly than Garmin, with scores of 47 and 49 respectively, although it's certainly in the ballpark. While the app is certainly complete, it could do with a thorough redesign. The visuals are hardly slick and it's so filled with options and tweakable settings that it can be a little impenetrable. It also affords a lot of space to your post run metrics, yet it's hard to dive deeper, with graphs and maps hidden behind option menus. It is, however, extremely rich. Aside from just reviewing your workout history, there's neat options for achievements, which puts your PBs front and centre. It also offers some nifty insights beyond just your times for set distances. Those are present, of course, but there are PBs such as 'best split at lowest heart rate', which delve a little deeper into you training. This means that if you're not a heart rate obsessed trainer, you can still benefit from having your bpm tracked and gain some pleasure from it, while other devices like the rather po-faced Garmins simply offer up the details, and let you work out what they mean for yourself. So they're great for training and running (if you accept the odd GPS blip), but how do they sound? Well, we've been really impressed. Biometric headphones often put sound quality at the back of the queue, but the Jabra Sport Pulse are clear, well defined and bassy. The mid-high definition is certainly admirable, and thoroughly pleasant to listen to. Battery life was a big gripe of ours when reviewing the Jabra Sport Coach last year, but we're pleased to say that the Jabra Sport Pulse fares a little better. We ran for two hours and drained about half of the battery, which puts a marathon within reach, depending on your ability. It's a pretty good showing, given the amount of data that's being tracked. We're highly impressed with the Jabra Sport Pulse, both from the perspective of accurate and useable heart rate tracking and the breadth and variety of workouts. It's one of the best heart rate monitors we've tried, with a rich array of clever metrics to boot. While piggybacking GPS from a smartphone is far from ideal, by offering such a rich array of sports tracking in a useful form factor, the Jabra Sport Pulse makes a great case for hearables.